Shopping for a new BMW X5? Skip the V-8—BMW’s base turbo-6 in the X5 pulls its weight (and yours) well. If you must spend more, ante up for the high-buck interior trims that elevate the X5’s cabin to almost ultra-luxury-car standards. The 2019 BMW X5 grows even closer to being the do-it-all vehicle in its family. Two decades ago, BMW had no SUVs in their lineup. Today, the X3 and now, the 2019 BMW X5, are two of the best vehicles they build, and are two of their best sellers. Life comes at you fast. That’s even the case with the X5 xDrive40i and xDrive50i, the two new crossover SUVs BMW has to offer this year. The X5 hasn’t cut anything new from the standard-issue SUV cloth but the details suit it better. The upkick at the rear pillar reminds us it’s a BMW and not a Sorento; the hiccup over the rear wheels gives the back end a planted stance that shades more toward performance than utility. The X5 has one of BMW’s best cockpits in years, too. It strikes a great balance between concept-car purity and logical organization—and it looks especially right with crystal-tipped controls and supple premium leather. BMW drives the X5 closer to sedan-style performance with each new generation. This time, again, it relies on a couple of powertrains to do the not-so-dirty work. We’d normally be all over the 456-horsepower, twin-turbo V-8, but BMW’s 340-hp turbo-6 drops 0-60 mph times of 5.3 seconds through a sweetly tuned 8-speed automatic and rear-biased all-wheel drive. Shod with street tires and steering that’s sometimes overly eager, the 2019 X5 comports itself with verve, if not outright driving joy. It’s adept in muck, too, even when run-flat summer tires wrap its big wheels. With a torque-vectoring rear axle, four off-pavement drive moves, and a dedicated off-road package, the X5 can slog its way up a cabin dirt road to respectability usually reserved for ancient pickups, beater sedans, and the entire Subaru oeuvre. 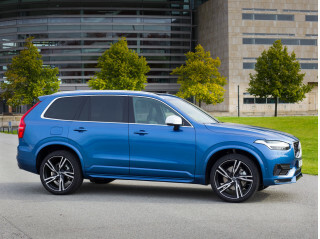 The 2019 X5 takes up more space on the road and in the garage this year, with an inch more overall length and a 117.1-inch wheelbase that guarantees great leg room for all. Five adults can fit, with no worries, and marvelous multi-contour seats make the ever-rising X5 price tag seem sane. So does standard automatic emergency braking. The 2019 X5 does upcharge for myriad features beyond an exemplary standard set of gear. It’s not quite nickel-and-dime territory, but will BMW owners want to pay to use Apple CarPlay after the first year—when they’ve already spent more for real leather upholstery, Bowers & Wilkins audio, and open-pore gray wood? We doubt it, though it’s a bit of crass pocket-digging on top of the BMW’s base price of $61,695 for the 6-cylinder and $76,745 for the V-8 xDrive50i. The BMW X5 dazzles more inside than it does outside. SUVs don’t have much room for radical styling. With the 2019 X5, BMW admits as much. The X5 adds a fillip here and a fresh cue there, as it morphs into its new generation. We’re more convinced by the progress inside, where BMW delivers a cabin that’s equal parts warm and contemporary. BMW calls the styling “balanced sovereignty,” which wouldn’t be a bad bit of sloganeering for the future King William. Given that most SUVs today look like angry mumps patients, the X5 does a fine job at offsetting its massive air intakes with its grille and standard LED headlights. What distinguishes this X5 from the last appears in the sideview. BMW’s stamped more pronounced lines down the side of the X5, with a gentle hiccup over the rear wheels that draws emphasis to the rear end, where a slight upkick to the shoulder line hints that this is the same BMW that builds sedans like the 5-Series. With that, the catchy LED taillights, and a split two-piece tailgate, the X5 manages to subvert the usual two-box boredom, and we’re all about subversion. To tell apart the distinct X5s offered for 2019, BMW details them with distinct body bits. 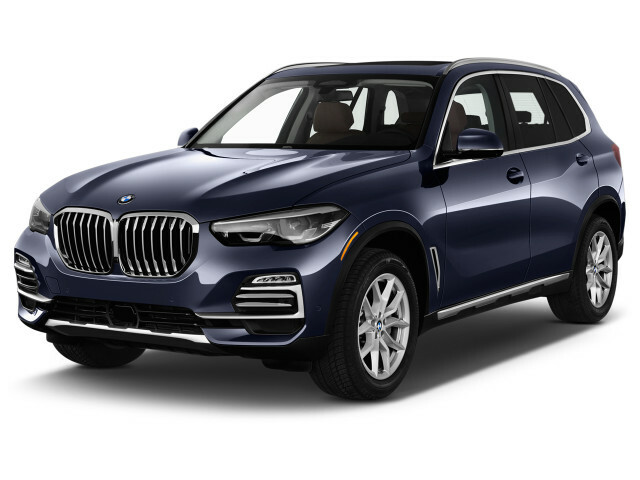 The X5 xLine trim wears satin aluminum trim and skirts and black wheel lips; M Sport models get an aero-tweaked front end, different alloy wheels, and body-color arches. The X5 puts BMW’s best design instincts on display in the cabin. The X5’s attractive cockpit melds screens and controls grouped in banded metallic frames, across a wide and shallow horizon. It’s most interesting at its reach-iest, with a crystal-tipped shifter and iDrive controller, and open-pore gray wood that lusters to beautifully subdued effect. The X5’s synthetic leather-covered dash can be trimmed in real hides. While the X5’s dash and its streamlined shapes are growing more concept-like in their execution, without overwhelming with touch interfaces or screens, there’s still room for fixes. The X5’s digital gauges and displays could use more contrast, especially in navigation mapping, and the oddly shaped digital speedo and tach can be hard to comprehend at a glance. The BMW X5’s built with an M edition in mind; its excellent ride gets offset by occasionally overfast steering. For the 2019 model year, BMW fits two of its best drivetrains to the X5. A third’s on hold; a fourth is coming, but not for two more years. With either engine, the X5 coddles passengers with a smooth, controlled ride, even with big run-flat tires clamped to its wheels. The spendy drivetrain choice pairs BMW’s excellent twin-turbocharged, 4.4-liter V-8 with an 8-speed automatic and rear-bias all-wheel drive. In the X5 xDrive50i, the V-8 pumps out 456 hp and hits peak torque of 479 pound-feet at just 1,500 rpm. It’s pegged at a 0-60 mph time of 4.6 seconds, and a top speed of 130 mph (or up to 155 mph with the right option boxes ticked). It’s a glorious engine in other applications; we haven’t driven it yet, but faced with the X5’s excellent base powertrain, it’s difficult to see the V-8 as anything but a prestige buy. That’s because BMW’s single-turbo 3.0-liter inline-6 pours out 340 hp and 330 lb-ft, the latter also delivered at 1,500 rpm. This X5 xDrive40i pounces on distant openings in traffic, rushes to speed with a muted snarl, and hits 60 mph in just 5.3 seconds, on its way to a 130-mph top speed (or 150 mph, properly equipped). The acceleration’s strong at nearly any usable engine speed, and it’s all the more impressive since an unladen X5 checks in at 4,813 pounds in xDrive40i trim, a hulking 5,170 lb as an xDrive50i. BMW says it’s undecided whether it will offer a turbodiesel in U.S.-market X5 SUVs, but a plug-in hybrid with 40-ish miles of battery-only driving will appear in 2020, as a 2021 model. Power rifles through all four wheels via an excellent 8-speed automatic that’s never caught off guard. BMW can ship more power to the all-wheel-drive system’s rear wheels in Sport mode and according to traction needs; as of yet, no rear-drive X5’s been confirmed. An available sport differential uses clutch packs to move power across the rear axle for torque-vectoring control, and an electronically controlled rear differential can act like a lock to ensure more even acceleration. All X5s have a brake-by-wire system that mutes the stuttering pedal feel of anti-lock control. Tire sizes range from base 19-inch treads to grippy 22-inchers, staggered at 275/35 front, 315/30 rear. From the base independent-suspension setup, the 2019 X5 can veer off in two very different directions. Every X5 has a control-arm front suspension and a five-link rear suspension. All cars get electronically controlled dampers, but some X5 SUVs also get an air suspension. The air springs soak up the heft applied to the SUV when towing or carrying people, and also give it six positions of ride height. The air-spring X5 lowers itself more and more, as speeds rise, while it also can deliver a softer ride overall. It’s a handy aid to the X5’s off-road package, a first for the model. In off-road mode, with that added hardware (underbody protection, etc. ), the SUV can clear obstacles of up to 8.7 inches, and can ford through about 20 inches of water. When it submerges, the air suspension locks into its height setting and the vehicle closes its grille flaps. With the air springs, the X5 also can enter a flat-tire mode that makes it easier to change out one of the run-flat treads. With the right hitch, the X5 can tow up to 7,209 pounds. 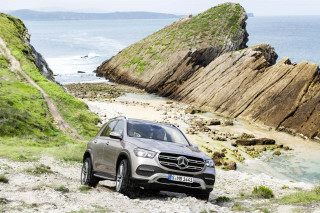 Off-roading comes with its own drive modes: for snow, sand, gravel, and rocks, all of which program the drivetrain, all-wheel-drive system, and ride height for ideal traction. We drove the X5 xDrive40i on moderately challenging dirt paths on high-performance tires, and it pulled through without slipping and sliding too far off track. Our test vehicle came outfitted the off-road/air spring setup, and also with rear-wheel steering and 21-inch wheels. The system can adjust the rear wheels to counter-steer across 3 degrees at lower speeds. In the normal drive mode, that added input can make it difficult to place the X5, and to anticipate how much steering is the right amount. Switched into Sport mode, the steering responded more predictably—and as a bonus, left its ride quality unaffected. The adaptive dampers and air springs kept it blissfully flat and ready to hustle through central Georgia, even while its big 21-inch tires slapped at the road audibly. In the other performance direction, the X5 grafts on grippy tires and sport-SUV hardware for what BMW says is the most composed X5 it offers. The “Professional” suspension can’t be coupled with the off-road gear or air suspension. It comes instead with a sport-tuned suspension, sticky tires, and active roll stabilization, which counters cornering force with opposing pressure to yield a flat ride through corners. We haven’t driven this version, but it’s clearly teed up to precede the coming X5 M; maybe that performance edition’s worth the wait? 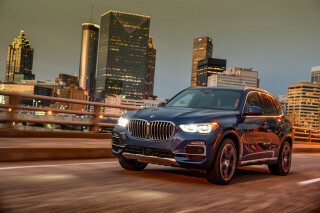 The 2019 BMW X5 blocks out excellent space for five adult passengers, plenty of cargo–plus, it responds to a swift kick. The new X5 rides on a new architecture that provides more interior space and a more rigid body. It boosts the SUV’s reputation for quiet, luxurious transport, especially when it’s decked out with the ritziest touches. The new fourth-generation X5 grows in all critical dimensions. It’s 194.3 inches long, up 1.1 inches; it’s 69 inches tall, up 1.0 inches, and 78.9 inches wide, up 2.6 inches. It rides on a 117.1-inch wheelbase. Our first drive of a fully outfitted X5 xDrive40i didn’t give us the chance to sample BMW’s base 8-way power front seats. In the multi-contour seats sold as options on that model, and standard on V-8s, we quickly found a great driving position by toggling the seats forward, by tilting up the bottom cushion, extending the leg support at the front of the seat bottom, and by adjusting the seatback bolsters for a more snug fit. Drop the X5 into Sport mode and it does the latter automatically. Heated seats come standard, and cooled seats ar available. The X5’s cockpit has lots of spaces, big and small, for storage. The door pockets hold 64-ounce plastic bottles; the split-lid console can hide smaller tablets and man-bags. A smartphone wireless charging surface keeps change rattle-free if you’re stuck in the iPhone 6 era—no shame. In the second row, BMW’s stretched the X5 to dole out the back-seat room the price tag commands. There’s nearly as much leg room in back (at 37.4 inches) as in front (39.8 inches). It’s the same with head room, at 38.7 and 40.8 inches, respectively. We put three adult men across the back bench without complaint for a short drive. The minor quibbles that keep the second row from excellence are limited foot room under the front seats, a lack of reclining seatbacks, and no slide function for the seat. A third-row seat can be fitted to xDrive40i X5s, but we didn’t have the chance to sit in one. Regardless, BMW would probably rather sell you a three-row X7 SUV when it goes on sale next year. The X5’s cargo space yields 33.9 cubic feet behind the second-row seat, and 72.3 cubic feet behind the front seats. It’s possible to sleep comfortably back there on the flat-folded cargo floor, if the Kimpton’s full up for the night. BMW still sells its split-tailgate on the X5, and fits it with kick-open, hands-free operation. The top three-quarter liftgate swings up, and a mini-tailgate drops down, all power-assisted. A button on the tailgate lowers air-suspension models for easier loading. The build quality on the South Carolina-sourced X5 is laudable. BMW’s put one of its best interiors in the X5; in pricey trims, with gray-stained wood and a crystal-tipped shifter it’s what a mini-Rolls-Royce SUV might look like, if it went to German boarding school. Synthetic leather is standard, though BMW will sew on plush real hides for a fee. It’s generally a quiet cabin, too, but BMW only puts on acoustic side glass if you pay for it, and those big 22-inch optional tires generate noticeable road noise. BMW’s X5 has crashed well in the past; we’re waiting on new data. Every 2019 X5 gets forward-collision warnings with automatic emergency braking, parking sensors, blind-spot monitors, run-flat tires, LED headlights, automatic high beams, and active lane control. The X5 also has a commanding view of the road, despite thick roof pillars and big mirror housings. A bundle dubbed Active Driving Assistant Pro costs extra, but includes lane-change assist and traffic jam assist, which lets the X5 follow the car ahead at low speeds. Safety options include a surround-view camera system, night vision, and a head-up display that casts its information over a larger area. The X5 can also reverse itself up to 164 feet on the path it just traversed, if the driver wishes. With automatic parking assistance, the X5 can guide itself into most perpendicular or parallel parking spots. We’ll update this section when the NHTSA and the IIHS publish crash-test scores. BMW has applied every conceivable tech function to the new X5—but CarPlay will cost you after day 366. BMW sets up 2019 X5 drivers with a good amount of standard gear. Options turn the X5 into a very luxurious machine with some off-road ability. The X5 xDrive40i’s base price of $61,695 includes $995 destination, and also includes power features, power tilt/telescope steering, run-flat tires, keyless entry, a panoramic roof, power heated front seats, wood trim, ambient lighting, LED headlights, automatic climate control, synthetic leather upholstery, navigation, and 19-inch wheels. BMW's 4-year/50,000-mile warranty includes three years of maintenance as well. With the xDrive50i, BMW charges $76,745. It gains leather upholstery, multi-contour front seats, a universal garage door opener, four-zone climate control, and satellite radio. Standard audio includes an AM/FM/XM setup with Bluetooth audio streaming and USB connectivity. BMW offers Apple CarPlay compatibility, but charges owners a yearly fee after the initial one-year period of service. It’s a consumer-unfriendly move that is without parallel in the industry. At the same time, BMW will offer owners a connected-services package that will carry settings from one BMW vehicle to another via the cloud, will allow on-the-road Alexa service, and will even read email from a Microsoft Office 365 account. It also will offer drivers a digital key that allows a smartphone to unlock and lock the vehicle, though Apple devices will need to wear a sleeved key card that will communicate with the car. BMW’s latest iDrive infotainment system sports a lovely 12.3-inch touchscreen in its latest iteration, and for a small charge, BMW fits it with gesture control. It’s a nifty party trick to spin a finger in the air to quiet the radio, but it’s just as easy to spin the knob a few inches ahead on the dash. The system has a multitude of talents, from door to door navigation that routes the car and keeps tabs on where it’s parked. BMW offers a long list of option packages for the X5, to add features where they’re not otherwise standard. 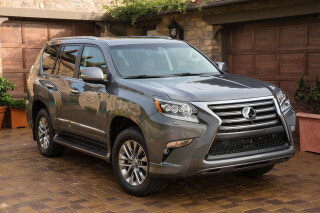 They include a Convenience package with keyless entry, four-zone climate control, and satellite radio. Cooled multi-contour seats with massaging come in another package. An off-road setup gets the sport differential, air suspension, and underbody protection. 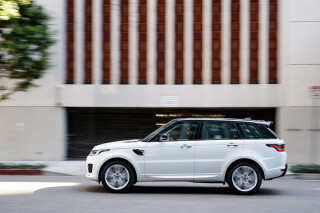 It’s not available on X5 SUVs configured with the Dynamic Handling package, which adds sport brakes, 21- or 22-inch wheels, the sport differential, an adaptive M-tuned suspension, active roll stabilization, and active steering. Other packages include a Premium pack with a head-up display, wireless smartphone charging, gesture control for infotainment, a surround-view camera system, and automatic park assistance. Remote start, soft-close doors, and adaptive laser-powered headlights bundle together in an Executive group. 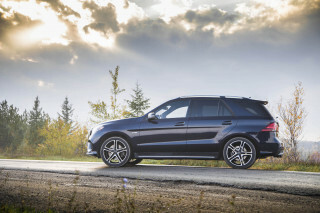 Other free-flow options include 20- and 21-inch wheels, remote start, air suspension, a trailer hitch, heated front and rear seats, a third-row seat (on 6-cylinder models only), the head-up display, cooled and heated cupholders, air scent package, M Sport brakes, active steering, a leather-upholstered dash, and Harman Kardon sound—a baby step toward the top Bowers & Wilkins 1,500-watt, 20-speaker surround-sound audio system. An old-school rear-seat entertainment system with twin headrest screens comes with more USB ports, perfect for charging users’ tablets that...checks notes...do the same thing as the entertainment system. 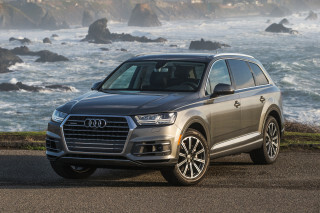 The X5 rates in the low 20s combined; a plug-in model is on the horizon. The BMW X5 comes with turbocharged inline-6 and V-8 engines. EPA ratings have gone up since last year, but as a big SUV the X5's still middling for gas mileage. The new X5 xDrive40i garners EPA ratings of 20 mpg city, 26 highway, 22 combined, while the xDrive50i is pegged at 17/22/19 mpg. For the record, last year’s most popular X5, the xDrive35i, garnered ratings of 18/24/20 mpg. BMW fits the new X5 with active grille shutters and start/stop to help it consume less fuel. There’s no clear evidence BMW will offer a diesel engine in the new X5. BMW has said it is putting emphasis on plug-in hybrids in the U.S., and will not confirm whether a turbodiesel X5 will ever be sold again in this market. It did confirm a plug-in hybrid X5 xDrive45e will arrive in 2020, as a 2021 model. That vehicle will sport a significantly upgraded battery pack as well as a new inline-6; together, those components should deliver plug-in electric range of about 40 miles, up from the 2018 model’s 14 miles.